James Breakwell, who goes by the Twitter handle XplodingUnicorn, shares the funniest things he's heard his daughters say. 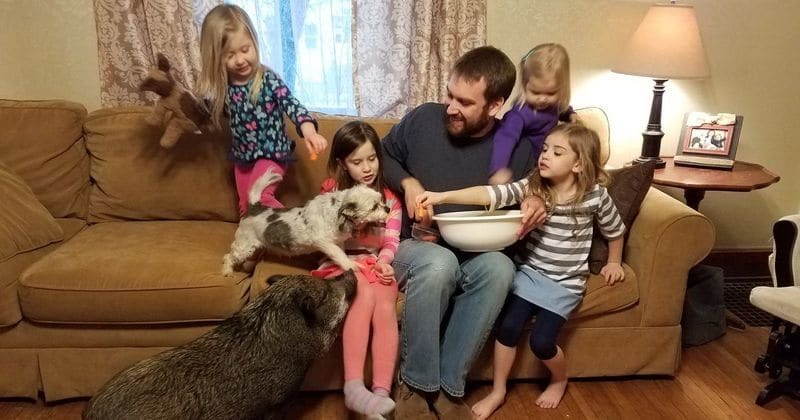 James Breakwell is a dad to four girls aged seven and under who provide him much entertainment with their unique perspective on the world. He has been sharing vignettes of their hilarious conversations on his Twitter handle, XplodingUnicorn, which has amassed him over one million followers on the social media sharing website. Read on for some of the funniest tweets we handpicked for you. 3-year-old: *ties in a race* We all win! 3: And we all lose. 3-year-old: Can I stare at my lunchbox? 7-year-old: We’re playing exercise class. Me: Why don’t you just exercise for real? 5-year-old: Can penguins play basketball? Time to check her room. 3-year-old: Today you can drive. 3: And tomorrow I can. 5-year-old: Why can't dogs go to school? 5: They let in boys. Me: Don't do that. She's sick. 7: I want a day off, too. 5-year-old: Why does perfume always smell like flowers? Me: What should it smell like? 5-year-old: I'm writing a book. 5: I Ate Too Many Cupcakes. 5: It's just pretend because you can never eat too many cupcakes. 5-year-old: Can I get French fries? Me: You're supposed to be sick. 5: Can I get French fries and 7 Up? 3-year-old: I said no rain. Me: It's not up to you. 5-year-old: What day is it? 5: I don't do anything on Saturdays. Me: Just kidding. It's Tuesday. 5: I don't do anything on Tuesdays. 5-year-old: Can we have candy for dinner? 5: Can we have candy after dinner? 5: Can we have nothing for dinner? 3-year-old: I'm taller than you. 3: I am when you lay down. 3-year-old: I got dressed all by myself! Me: You're only wearing socks. 3: I got dressed enough. 7-year-old: What did you do at work? 7-year-old: Girls are better at being doctors. Me: What are boys better at? 5-year-old: When can I have my own phone? Me: When you're my age. 5: I'll never be that old. 3: Almost as strong as Mom. 5-year-old: You’re the best dad! 5: That I’ve met so far. Me: Cupcakes aren't a breakfast food. 5: I know. They're an all-day food. 3-year-old: Why do you have a mustache? Me: Why do you think I have a mustsche? 3: To keep away girls. Me: What did you do at school today? And don't say, "Nothing." 7: I'm thinking of a different word for nothing. 3: So it doesn’t run away. Me: You're still in your pajamas. 5-year-old: I'll get dressed soon. Me: It's 4 in the afternoon. 5-year-old: I found a feather. 5: How many more till I can fly? Me: That's all you have to say to me? Me: Do you know what happens when we put our heads together? 5-year-old: Why don't girl deer have antlers? Me: Maybe they don't want them. 5: Yeah. They're too smart to fight.